The Queen's Rising is a beautiful and imaginative story about Brienna, a young woman torn between identities, and the journey she takes to help reclaim her heritage. The tale starts in a kind of quasi-French or other Western European Rennaissance-era kind of place where a very describable goal for children and young people is to 'passion' in a particular school: art, wit, dramatics, music, or knowledge. To do so, children must become 'ardens', attend Houses and train at an average of seven years with a Master or 'ariels'. Then they may graduate by receiving a cloak, find a patron, and continue to pursue their passion. I loved this worldbuilding, I just felt so at home with everything Brienna was learning. Brienna joins Magnolia House, but as she is unable to find a passion she can truly excel at she settles on knowledge, and when she is seventeen she finds it difficult to secure a patron until along comes someone who can help with the mysterious visions she has been experiencing. This patron leads her into a war for the throne of the neighbouring land, from which Brienna's absent father hails, and I think it's more based on the medieval Celts, with women warriors and woad and Irish-Gaelic inspired names. I think the best thing about this book is the beautiful word choices Ross uses. Whenever there is a chance to use a bland description or a truly beautiful one, Ross manages to grab the beautiful description and wrangle it into her book. Brienna herself was a brave, resourceful character who worked hard to uncover the mysteries surrounding herself and help the plot move along. I loved the time spent in Magnolia House with her arden-sisters and the slow introduction made to the incredible worldbuilding in that respect. Magnolia House was almost like a boarding house crossed with a University and a distinct European feel to it. Think Girl with a Pearl Earring or The Merchant of Venice. I really hope the next books in the series follow Brienna's arden-sisters and we get to see more of this kingdom. The second half of the book takes place primarily in Maevana, a queen's realm currently being ruled by a cruel king, and Brienna is the answer the rebels have been looking for. Using a disguise, she infiltrates the king's court in an attempt to recover some lost property that will set the real queen back on the throne. This half of the book almost forgets about Brienna's time at Magnolia and turns into a very typical, predictable YA fantasy adventure. Not that there's anything wrong with that! I've simply read enough of these types of stories to know where it's going to go. I still enjoyed it, but I think since the Magnolia House half to me seemed more original and inventive, I liked the worldbuilding better in the first half. The second half, like I said, was more of an adventure that the first half was leading up to, even though they take place in two very different settings. I do have two issues with the book. Brienna trains for a year with each ariel before she settles on knowledge as her passion, and she only has three years to master it. This means that she’s had some training in music, art, wit and dramatics, and I was really hoping that that training might come in handy during her subterfuge. Yet instead of any of her time at Magnolia being of use, the book is basically split into two parts: Magnolia and post-Magnolia, and it almost seems as if they have nothing in common. Brienna learns to swordfight post-Magnolia, and that comes in handy, but she doesn’t have to use her passion training at all. I think part of the reason why is because she kind of sucked at them, but she doesn’t even really use her expanded knowledge to help her succeed in her mission, so it feels a little disjointed. The other issue I have with the book is that while there is conflict in that Brienna has a goal and she keeps getting hurdles put in the way, she clears these hurdles rather easily. She’s smart and can come up with solutions to her problems but I never really felt like Ross took the worst thing that could happen to her. It wasn’t exactly helicopter authoring in that Ross put Brienna in bad situations then lifted her out again, just that, for example, when Brienna was risking her life and doing things she shouldn’t be doing, she never got caught by the bad guys, even though I really hoped that was where it was leading. 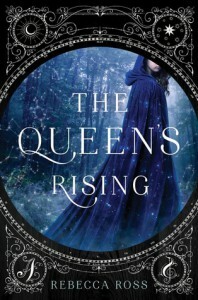 Overall I thoroughly enjoyed The Queen's Rising, with its gorgeous writing and creative and innovative worldbuilding. While I do think the entire story is self-contained and makes an excellent stand-alone, I would also like the next books in the series to focus on Brienna's arden-sisters and their adventures, rather than staying with Brienna and whatever she does next. I guess I'll have to wait and see!